The Coleman Colorado 2 person fishing kayak has many advantages to it that are overlooked by the average person. Many people forget that while there are a ton of fishing kayaks out there many are made of rotomolded plastic. This is not a bad thing until you start making noise on it by putting down your paddle, placing something down or simply moving around. The thunking noises amplify in the water and often scare potential fish that could be caught. While there are a lot of different types of fishing kayaks to choose from few inflatable models are actually made specifically for fishing and even fewer are made for multiple people and have a rather generous maximum capacity. Who is the Coleman Colorado for? Who is the Coleman Colorado not for? The Canoe- Kayak hybrid, the Coleman Colorado 2 Person Fishing Kayak by Sevylor is rigged specifically for fishing. Many people would not dream of fishing from an inflatable kayak as the first thing that they think of is puncturing it. That’s a fair statement but with this kayak you don’t need to worry about that. I kind of left a bit of a cliff hanger in the previous paragraph didn’t I? Well the reason why I state that you don’t have to worry about punctures is because it is designed specifically for lake use! Lakes come with a wide variety of obstacles such as sharp rocks, broken branches and just about any pointy obstacle that you can think of lying near the shore. 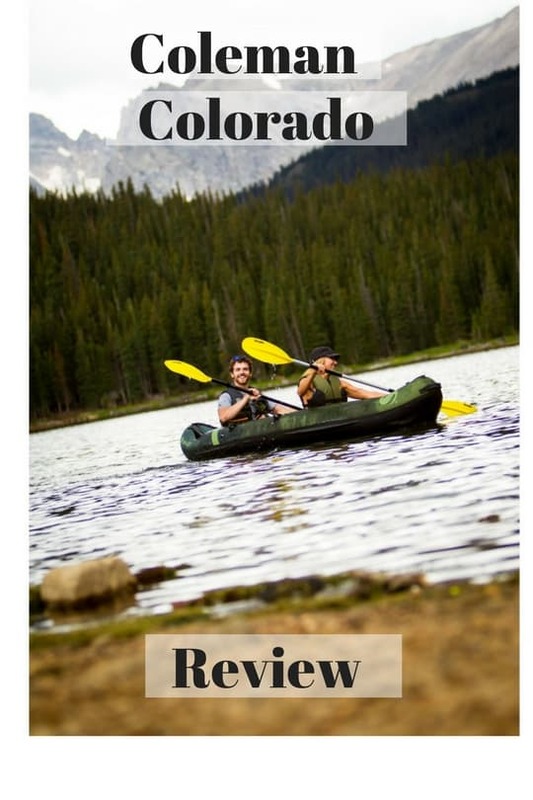 Fortunately the Coleman Colorado 2 Person Fishing Kayak is made of 18 gauge PVC construction that is covered with 1000 D Tarpaulin bottom and 840 D nylon. These materials insure that an accidental hook jerk will not puncture the kayak. Sevylor has gone one step further and made sure that this kayak was made with multiple air chambers so that if one happens to get punctured you can still paddle back to shore without having to swim back. Now that we got the inflatable part out of the way we can talk about it’s features. The Coleman Colorado 2 Person Fishing Kayak has gone in a bit of a different direction from other inflatable kayaks in that it has all the add on accessories that a fisherman would want all pre mounted onto it! Some mounted accessories include two Berkley Quick Set Rod Holders for you and a friend, paddle holders that are handy while casting as well as trolling motor fittings and D Rings to attach other equipment. It also has mesh pockets on the sides to put tackle or other accessories you may find helpful. What many people also don’t realize about inflatable kayaks is that they actually make less noise. This is a key advantage for fisherman who want to stalk fish silently without giving them warning to swim away! We went through a list of benefits and features however one thing that particularly bothers me is the fact that this package comes with a carry bag and pressure gauge but not a pump! This is particularly bothersome as most paddle boards, kayaks ususally come with a pump and pressure gauge mounted onto it! The Coleman Colorado 2 Person Kayak also does not come with a paddle, which is a bit more common, but still.. Most customers that have bought the Coleman Colorado 2 person Fishing Kayak have been impressed with it’s durability and functionality. Some people have even taken the liberty of turning it into a fully functional fishing vessel with trays that have a trolling motor, fish finder and many other doodads attached! Many people have also stated that this boat is rover friendly. Many people appreciated the fact that it came with these rod and paddle holders with quite a few of them stating that the mesh pockets were highly useful as well. Some Negative comments have included the fact that this kayak is not suitable for taller folks especially for a 2 seater. It is a better vessel for one taller person and say a kid or a dog. The seat backs also give some of the taller customers problems which limits their time in the boat or having to buy a replacement one. Other customers had some trouble with leisurely paddling because they found their paddles were hitting the pop up rod holders which compromised their paddling movements.